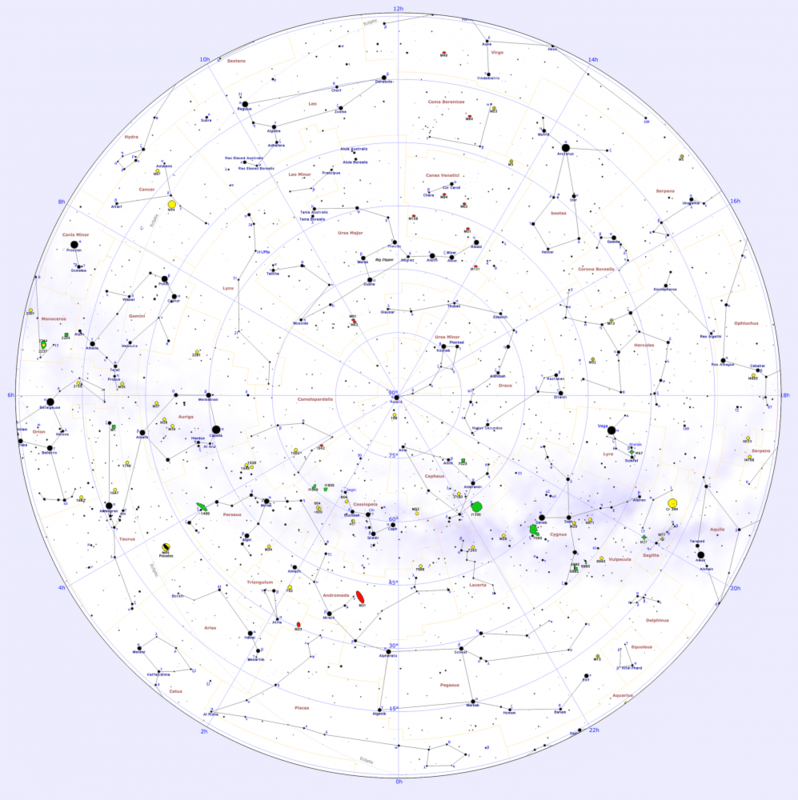 Northern constellations are those found in the northern celestial hemisphere, located north of the celestial equator. The majority of the modern 36 northern constellations are based on the Greek constellations, first catalogued by the astronomer Ptolemy in the 2nd century. Many of them are associated with Greek myths and legends. However, most of the Greek constellations, including the constellations of the zodiac, have a much longer history, going back to Babylonian times and some even to the Late Bronze Age. Two entire constellation families are found in the northern sky. The 10 constellations in the Ursa Major family all lie in the northern celestial hemisphere and can be seen rotating around the north celestial pole throughout the year from northern latitudes. These are Boötes (the Herdsman), Camelopardalis (the Giraffe), Canes Venatici (the Hunting Dogs), Coma Berenices (Berenices’ Hair), Corona Borealis (Northern Crown), Draco (Dragon), Leo Minor (the Smaller Lion), Lynx, Ursa Major (the Great Bear) and Ursa Minor (the Little Bear). Similarly, all the constellations in the Perseus family except Cetus (the Whale) lie in the northern celestial hemisphere. These are Andromeda (the Chained Maiden), Auriga (the Charioteer), Cassiopeia (the Queen), Cepheus (the King), Lacerta (the Lizard), Pegasus (the Winged Horse), Perseus and Triangulum (the Triangle). The largest northern constellations are Ursa Major (1279.66 square degrees), Hercules (1225.15), Pegasus (1120.79), Draco (1082.95), Leo (946.96), Boötes (906.83) and Pisces (889.42). The smallest constellations in the northern sky are Equuleus (71.64 square degrees), Sagitta (79.93), Triangulum (131.85), Corona Borealis (178.71), and Canis Minor (183.37).